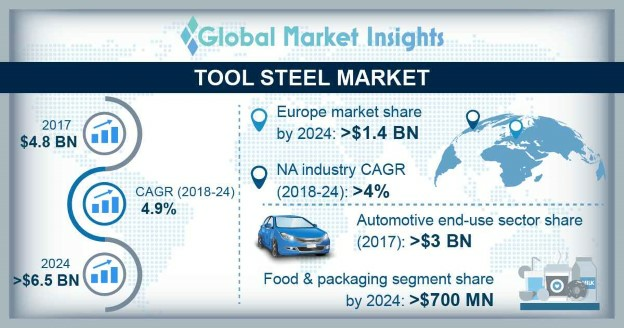 Tool Steel Market size is set to surpass USD 6.5 billion by 2024; according to a new research report by Global Market Insights, Inc. Growing demand for cutting instruments from various industries such as power generation, food & packaging, aviation and automotive sectors should accelerate tool steel market growth. This product finds extensive use in the manufacture of gear cutters, tool bits, planers, saw blades, punches, router bits, drills and taps. It provides numerous advantages including high thermal conductivity, wear resistance, cheaper machinability and allows better polishing making it suitable for cutting instrument manufacture and stimulating tool steel industry growth. In 2017, chromium tool steel market size exceeded USD 1.3 billion. It imparts various beneficial properties such as oxidation, corrosion and heat resistance. This product is economical as compared to molybdenum & tungsten grade items and find wide use in several aircraft components such as catapult hooks, cable lugs, elevon hinges and airframe structures which is likely to further boost product demand. Molybdenum tool steel market size may exhibit gains over 4% in the forecasted period. It improves product’s toughness, hardenability and wear resistance which prevents breaking or chipping on impact. Also, the materials find extensive adoption in cold-work uses such as punches & blanking dies, cutting tools which include milling cutters & end mills and automobile cam-rings which should stimulate the market growth. Germany tool steel market size from injection molding applications may register gains of over 3.5% up to 2024. The country is experiencing growing demand for molded products from the packaging sector on account of improved performance, cost savings, durability and strength imparted by plastics. They possess various advantages for plastic molding such as resistance to corrosion & temperature, hardness and thermal stability which should stimulate market growth. China tool steel market demand from aerospace is likely to exceed USD 70 million till 2024. The country has witnessed surging demand for air travel owing to rising disposable income, and government initiatives to attract investment in the aviation sector. This product possesses exceptional fatigue strength, superior performance and high temperature hardness which increase its suitability for use in aerospace shafts, afterburners, discs and vanes, thereby stimulating market growth. Hitachi Metals, Ltd., Voestalpine, Sandvik, and Dongbei Special Steel Group Co., Ltd are the major manufacturers in the global tool steel market. Other manufacturers include BOHLER, Eramet SA, Baosteel Group, Buderus Edelstahl GmbH and Nachi-Fujikoshi. Several industry participants focus on attracting new customers by launching new products and on strategic acquisitions to expand product portfolio, thus attaining competitive advantage.